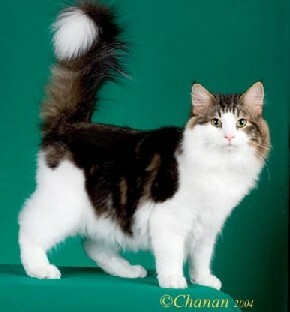 Featherland Cattery's breeding program currently focuses on the Norwegian Forest Cat and Selkirk Rex breeds. Our most successful show cat is CFA GP NW, TICA SGCA RW Fig Kollibri of Featherland (above), a very affectionate Norwegian Forest Cat. We are located in the Southern California area, in the beautiful rural community of Norco. 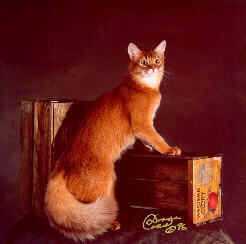 We no longer breed Turkish Angoras, but we continue to be involved with these rare and intelligent cats. Visit our Turkish Angora web page for more information. Our first Turkish Angora grand, CFA GP RW, TICA DGCA Featherland's Fuzzy Slipper, was CFA's highest scoring Turkish Angora in Premiership and the Southwest Region's third highest scoring cat in Premiership for the 2001-2002 show season! This is a picture of one of our Selkirk Rex. We were one of the foundation breeders of these cats. For more information about the Selkirk Rex, see the Selkirk Rex FAQ. We are also involved in Persian Rescue in the Southern California area. 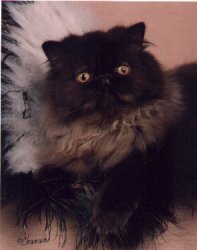 Please visit our rescue web site for information on adopting an older Persian in dire need of a new, loving home. Featherland's chocolate and lilac Persian program made incredible progress over the 17 years we spent working with these rare colors. 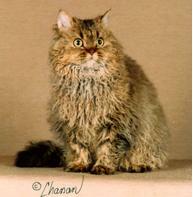 GRC Featherland's Weird Science was CFA's first chocolate or lilac grand champion in the Persian Tabby Division and was the Southwest Region's Second Best Tabby Persian. Pictured is GRC Cactusway's Chocolate Memories of Featherland, CFA's third self chocolate Persian grand champion, shown in memory of her late breeder (and my mentor) Toni Renzacci. Are you a pedigree-aholic like me? If so, come join our group of Pedigree Linechasers to trade pedigree information with fellow addicts. For those interested in the fascinating field of feline genetics, you may want to read a few of the articles I have written about this subject. I have also written a series of articles on health issues of interest to the cat fancy which are published via the fanciershealth list on Yahoo!groups. Check out our Cat Health Bookmarks section for many valuable resources. Come join an exciting new group of over 4000 cat fanciers interested in health issues regarding our cats by subscribing to our list using the button below. If you buy my feline genetics book, Robinson's Genetics For Cat Breeders and Veterinarians, by clicking through the link below, a portion of the sales price goes to support cat health research. Copyright © 1996-2008 Lorraine Shelton. Photographic images are the copyrighted property of the photographer and may not be copied, downloaded, printed, or otherwise reproduced without the express permission of the photographer.